Do you want to make your weekends more special? Call us to get our most exclusive weekend limousine and party bus special in greater Los Angeles. We offer 20% off on all the weekend services and provide excellent and timely transport for all kinds of events including sporting events, concerts and night outs. Contact us today to get the most reliable special transportation services! Have an unforgettable day in our limo by choosing the best suitable package for you. We offer special services for events like wedding, birthday, anniversary, sporting, theatre, concert, Quinceanera and bachelor-bachelorette package. In addition to these, we offer specials for dinner and evening packages to our customers. 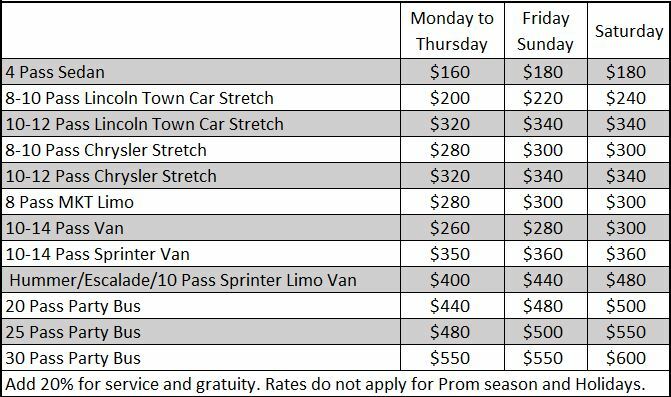 Choose one according to your requirement and have the best time in our limos. Our limos are stocked with beverages for the entertainment of our passengers. We charge slightly higher for late and early hour service. Extra charges may apply for excessive driving and high season. You are surely going to find our services reliable and courteous enough. We offer the best rates and provide timely services as per the requirements of our customers.